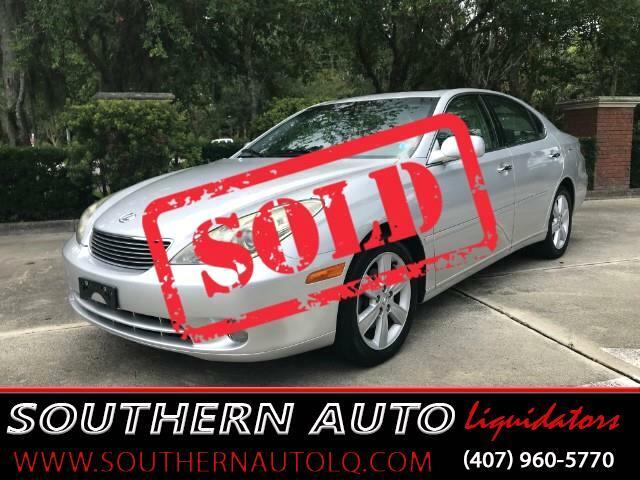 You are looking at a Super Clean “Classic Silver” 2005 Lexus ES 330. The Lexus ES 330 may be the smoothest, quietest car in its class. It's easy to drive and so smooth while flowing through the gears, keeping your passengers comfortable and making you look like a pro. Its 3.3-liter V6 engine and five-speed automatic are very responsive. Its supple suspension gives it a smooth ride on rough city streets, beat up freeways and poorly maintained back roads, and its anti-lock brakes are easy to modulate for smooth stops in everyday driving. This car is loaded with luxury and safety features found in higher-priced Lexus sedans: Handsome, high-quality, leather upholstery with wood trim comes standard. Also standard are automatic dual-zone climate control with interior air filter, power windows with auto up/down and jam protection, and a power moonroof. This Lexus was upgraded to feature a 240-watt Mark Levinson audio system, a six-disc CD changer, DVD satellite navigation, power rear sunshade, heated and ventilated front seats, wood steering wheel and shift knob, and 17-inch wheels and tires. Safety was a top priority when designing the ES 330. Standard safety equipment includes the full complement of airbags. It comes with three-point safety harnesses for all five seating positions. The front seats are designed to reduce whiplash. The outboard rear seat belts are fitted with force limiters and pre-tensioners. Standard anti-lock disc brakes (ABS) and electronic brake-force distribution (EBD. You truly can FEEL the smoothness and quality that is synonymous with the Lexus brand, when you drive this car. Come check it out for yourself! Call to schedule an appointment for a test-drive today!